April 22, 2019  When the United Kingdom voted for Brexit nearly three years ago, some thought it might mark the beginning of the end of the European Union. But a Brexit domino theory has remained just that. 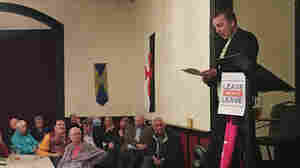 April 17, 2019  The Leavers of Lincolnshire group aims to provide a safe space "so you could come together and be proud to be a Brexiteer," says a member. "To not be called an idiot, to not be called a racist." 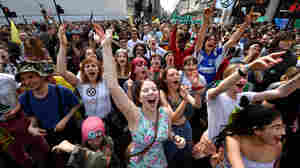 April 17, 2019  Thousands of people have taken part in climate change protests in London. Major roads and bridges have been blocked by environmental protesters, who say their actions will continue all week. April 15, 2019  Supporters of Britain leaving the European Union say they are often vilified as racists or xenophobes. Some of them have formed a support group to share their opinions and provide a safe space. April 10, 2019  British Prime Minister Theresa May went to Brussels again on Wednesday asking for a further delay to Britain's exit from the European Union, amid continued political deadlock in the U.K. parliament. April 10, 2019  European Union leaders meet in Brussels Wednesday for an emergency summit to decide whether to offer British Prime Minister Theresa May another delay to negotiate the U.K.'s departure. April 3, 2019  The play The Lehman Trilogy tells a story that spans more than a century: from the arrival of Henry Lehman in New York in 1844 to the 2008 bankruptcy filing of Lehman Brothers. March 29, 2019  British Prime Minister Theresa May's third attempt at getting lawmakers to approve her plans for the U.K. to leave the European Union failed in Parliament on Friday. March 27, 2019  British Prime Minister Theresa May said she will resign if Britain's parliament passes her unpopular plan to leave the European Union. Lawmakers have already voted it down twice by huge margins. March 24, 2019  One day after a massive anti-Brexit march in London, British Prime Minister Theresa May is facing new troubles. March 22, 2019  Britain will not leave the European Union on March 29. EU leaders granted the United Kingdom a short reprieve. March 21, 2019  British Prime Minister Theresa May is in Brussels Thursday, asking EU leaders for what she calls a "short extension" to the Brexit process, which is currently due to end next Friday. March 20, 2019  Donald Trump Jr. wrote in The Telegraph that British Prime Minister Theresa May should have listened to his father, and ensured that the split from the EU happened at the end of the month.